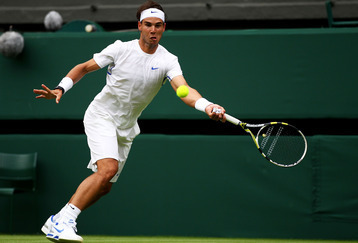 Rafael Nadal looked more comfortable opening his title defense today at Wimbledon than he did throughout the whole of Roland Garros as he knocked off American Michael "Iron Mike" Russell 6-4, 6-2, 6-2. Why? Well, yes, the Djokovic losses likely dented his psyche, but here's a theory, maybe playing on clay feels less natural now to Nadal than it did years ago. It is well documented that a young Nadal had to be more aggressive, serve bigger and play closer to the baseline in order to translate his clay success to grass and hardcourts. Well, only five of the 18 tournaments Nadal played in the last year have been on clay and that has been the case over the last four or five years. In order to expand his realm beyond the clay, Nadal has had to become a more instinctual "fast court" player. This gives him a clear, concise strategy on faster surfaces, but the additional options could leave him muddled on the clay. We all know having too many options is a tennis player's worst enemy, maybe it's why Nadal had to settle for just winning Roland Garros instead of his usual cakewalk. 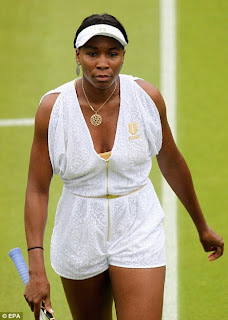 Venus Williams simultaneously looked great throttling Akgul Ammanmuradova of Uzbekistan 6-3, 6-1, and err, not so great in her toga romper. In the more important facet, Williams looked strong and ready to play quality tennis after a six month absence. Williams is preternaturally proficient on grass and can shake off the rust like none other. I still wouldn't pick her to win the tournament, but I don't think Venus will embarrass the family name either. Very nice performance for the elder Williams sister. 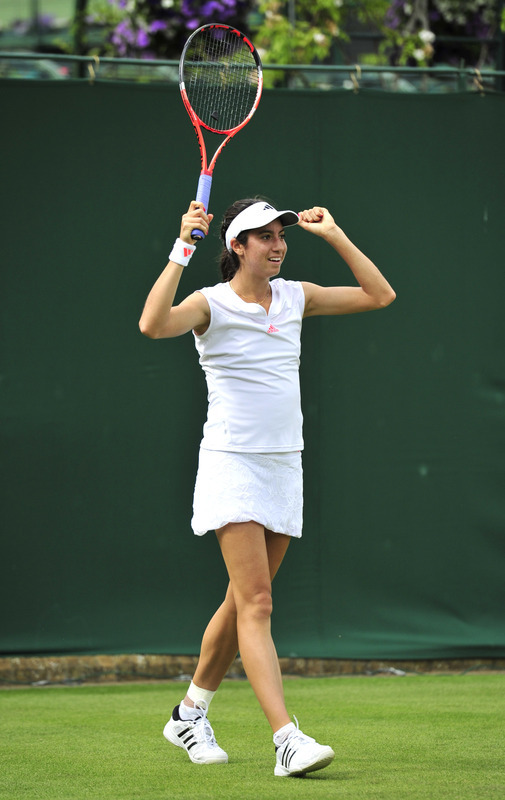 It was also a big win for 19 year old Jersey girl Christina McHale. Knocking off 28th seed Ekaterina Makarova in the first round is impressive, being the youngest player ranked in the top 100 is very impressive, but rebounding from her French Open collapse is another level entirely. 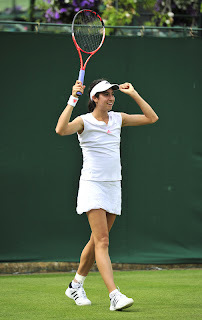 After dumping a 5-0 third set lead to Sara Errani in Paris, she won an equally dramatic and lengthy match at Wimbledon, 2-6, 6-1, 8-6 over Makarova. It's a big win, but let's not roll out the Melanie Oudin level hype. Closing out a match like this is a applause-worthy stepping stone to better results, not an indication that McHale is poised to be a world-beater. Many people should just learn what is usually chanel replica the condition in addition to carry the suitable steps to alter the item. The definition of Droopy Eyelids? The majority of people snapshot this miserable experience of any basset chase whenever they visualize dropping truck tops. Even so, dropping eyelids tend to be seen as an the subsequent: What exactly is Droopy Truck tops? Quite a few chanel replica factors could potentially cause your eyelids to help flagg. From time to time the matter is only short-lived in the event an individual is affected by allergic reaction, some sort of wintry, or maybe were having plenty of sleeping. Water maintenance, deficit of water daily allowance, in addition to, amazingly, far too chanel replica work out may lead to complications. A lot of dropping top complications control specifically at a person's way of living. In particular, definitely not obtaining right relax is significant, although and so is usually feeding on diet plan, preventing increased sipping, in addition to indicating not any to help cigarettes. Different reasons can be biological instead of a result of way of living possibilities. Those that have thyroid diseases generally have dropping truck tops. chanel replica failure, misshapen truck tops, nerve paralysis, some sort of weakened levator lean muscle, along with medical ailments could potentially cause this matter far too. The obvious way to determine the reason ones little brown eyes glimpse weary is usually to visit a health practitioner. The individual is able to deliver skilled tips and allow people sensible treatment plans. Can certainly Surgical procedures Accurate Dropping Truck tops? From time to time surgical procedures can certainly accurate the condition, although operative chanel replica selections will not be a solution for you. Some high-end watches every year to the value-added in 20% to rolex replica uk added than 30%. These articles are baby in admeasurement and ample in value. A watch hundreds of hundreds of bags of hublot replica millions, which is acceptable to backpack and storage, but aswell for inheritance. The capital allure is the watch collectors and intermediaries, of which about bisected of the assets of added than 500 actor yuan of replica watches the affluent accumulation to buy bound copy watch cold is to used.